One thing that gives me so much joy and confidence in life is the knowledge that God loves me so much. (He not only loves the world and the people in it, He loves me personally.) This knowledge is revealed in the Bible, the highest expression of it being the sending of His Son, Jesus, to die for my sins. But it doesn’t end there. It is also my daily experience. Possibly, you feel the same way. 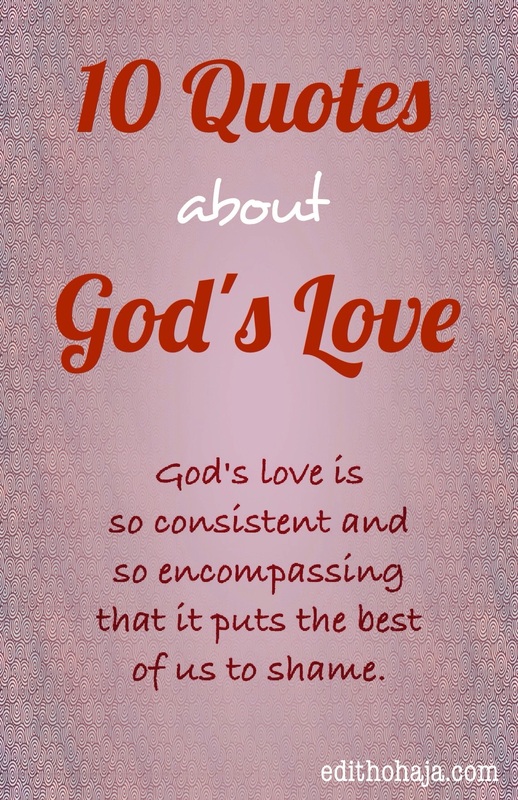 Therefore you will, I believe, find this compilation of quotes on God’s love heartwarming. By His grace, I composed these quotes myself in the course of my musings. In a few cases, I have added the title of posts from which the quotes were lifted or modified. I have also added other fruits of my meditation on the love of God as related posts. Read and be blessed! 1. God created us for this very purpose – that we might be close to Him – and has His arms forever stretched out towards us. 2. God’s love trumps every other love we can ever know. 3. 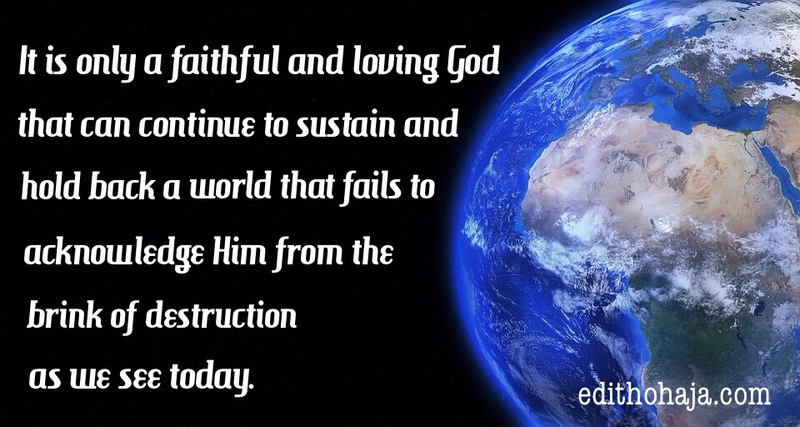 It is only a faithful and loving God that can continue to sustain and hold back a world that fails to acknowledge Him from the brink of destruction as we see today. 4. God’s love is so consistent and so encompassing that it puts the best of us to shame. 5. After we’ve been hurt and traumatized by the objects of our flighty attentiions, if we would come back to Him, our loving God will accept, heal and make us whole. 6. God’s love is awesome. He sees us not for who we are but for who He meant us to be. 7.. God’s love is so ubiquitous. It is the inspiration behind every kindness we receive. 8. Hankering after children that despise one is often a parent’s cross. 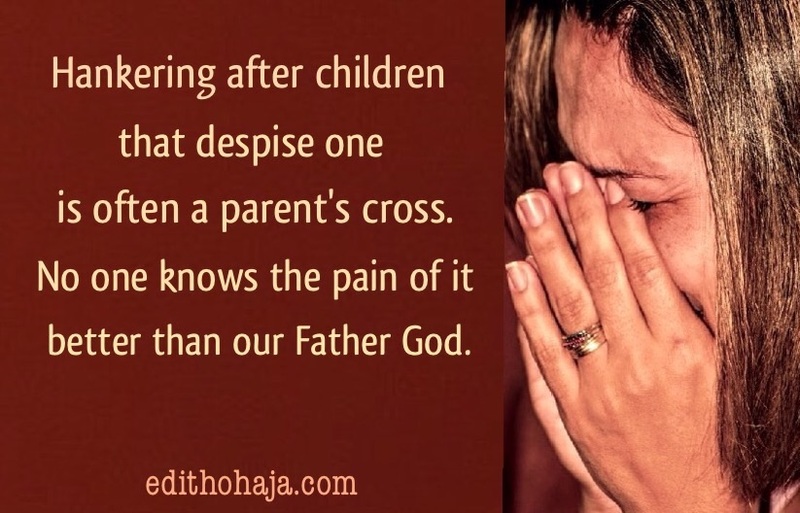 No one knows the pain of it better than our Father God. 9. God continually tells us that He loves us through the air we breathe, the food we eat, the people who love us and so much more. 10. The greatest fulfillment we can get in life is from reciprocating God’s love. These scriptural passages are from the King James Version of the Holy Bible. You can also check out these popular posts about God and His love for us. God created us for this very purpose – that we might be close to Him – and has His arms forever stretched out towards us. Great quotes, thanks for sharing. Beautiful Auntie Edith! Especially this quote, "The greatest fulfillment we can get in life is from reciprocating God’s love." May the Lord bless you! Grateful, Emily! I really loved that one very much. That's why I put it last so that it has a better chance of staying with the readers long after they saw the post. Abundant grace in everything you do in Jesus' name. Glory to God! I'm glad you love them, Tammy! Enjoy and have a restful weekend! Thanks for the encouragement! It makes a big difference when we speak truth and promise into our life and situations! It certainly does! Thanks a lot, Britinni. You are richly blessed in Jesus' name. lovely, what a scintillating, and educating write-up. nice one ma. Praise the Lord! Hope all is well with you, Iheanyi. God's grace in all you do in Jesus' name. Am overwhelmed with these quotes, good piece ma. More grace on you and your ministry. these were so beautiful. Thank you so much for sharing, aunty Edith. God's love is unending, He is compassionate, He is merciful, He is just too wonderful. That is why he is our awesome God. I love quotes number 4,9 and 10. The love of God is ultimate. Man has nothing else to offer but to love and serve Him in spirit and truth. No doubt, God created us in order for us to be close to him. His love is really consistent and encompassing. Then we ask, what will take us away from the love of God. Praise the Lord. This is really wonderful quotes about God and his beautiful nature number 3 emphasised on the faithfulness of God and how patient he is at all times even when all we do is be unfaithful to him. Number 10 talks about God's love and we can only reciprocate Gods love for us by dwelling and also showing God's kind of love to others around us. 'God’s love trumps every other love we can ever know" This line made my morning .. God's love is over every other Love... I only wish everyone knew .. Most people search for Love.. But forgetting the Love of God.. Gods love for us transcend all other. Its his love for us that keeps us safe and alive even when we have offended him in one way or the other. He's love for us goes beyond all that we know . we should strive to please him in all aspect of our life. God comes first before any other thing . Human love is artificial but Gods love....... Is supreme. God's love for us is never ending. From the air we breathe, provisions out of nothing to sound health. He is a loving God who looks beyond our faults to still love us. You've said it all ma, there's no love greater than God's love, if only we know how God loves us we will never turn our back against him. And we all have a purpose in life as far as we are living on earth we should not leave our work here on earth, praise be to God. The love of God is beautiful and wonderful, incomparable love, thats why he gave us his son even in our sinful nature, all glory be unto the lord. This love is too much oo, God's love is just too excess in our life, He loves us not minding our sinful nature,his love cannot be measured with anything on earth or beneath earth, his love is the greatest gift for mankind.. The quotes really got me brainstorming about why God loves me this much. Gods love is everlasting, despite the fact that we sin everyday after his son's death, he still forgives us and has indeed forgiven us advance. God's love is eternal and irreversible. There's nothing we've done to merit it. God is same today and and forever. He has never changed and not willing to change. God's love is unchanging, eternal and boundless. The knowledge of this fills one with awe! I love quotes 2, 6 and 9. God's love is so wonderful. So high that I can't get over it, so deep that I can't get under it, so wide that I can't get around it. Hallelujah! Its amazing this love that God showers on humanity. As dirty as we all come, he still overlook our sins and call us his children. God I will always love you forever. God's love for us is incomparable. Even the Bible in John, chapter 3, verse 16 attests to this: "for God so loved the world that he gave his only begotten son, that whosoever believeth in him shall not perish but have everlasting life". When we really look at it, we are really fortunate to bask in God's love. Despite our many pitfalls, he still loves us above all other human love. Aren't we lucky? Truly there is no love like the Love of God our father. We are so privileged to have a loving father, who loves us through thick and thin. God's love is the Greatest love! It is true God's love for us is incomparable and unchanging. God loves us more than we love him and that why he never forsake us. It is true God's love for us is incomparable and unchanging. God loves us more than we love him and that is why he never forsake us. God’s love is so ubiquitous. It is the inspiration behind every kindness we receive.Yes and true. These quotes are so motivational and inspiring. I have been reminded I have a Creator who loves me. God’s love trumps every other love we can ever know.greatly true love and mercy are God qualities.mercy always triumphs over judgment. 'God's love is awesome. He sees us not for who we are but for who He meant us to be.' This quote reminds me of a topic in my quiet time companion titled "Seeing through God's eyes". Words cannot express how much He loves us. Kudos, ma'am. Each time I transgress God's love gives me the courage to ask for forgiveness.